Here's a question I've seen a few times; how is Forge Engine different from (or similar to) Savage Worlds? Both are universal systems, that support traditional fantasy and modern games. Forge Engine has species, Savage Worlds has races; both of these give advantages to certain attributes, and reflect the inherited aspects of characters. Forge Engine has traits, Savage Worlds has racial edges; both of these balance the inherited aspects of characters, and in both games these traits and racial edges have costs that reflect the value of the aspect. 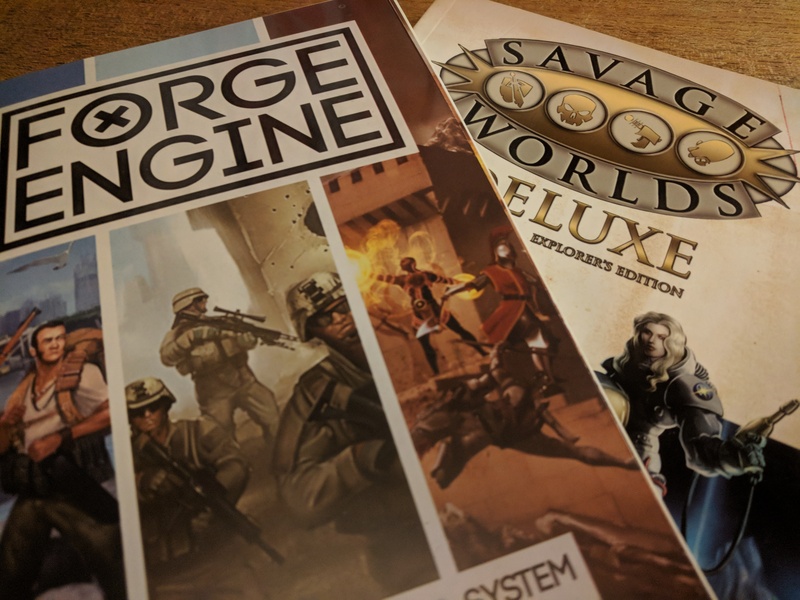 Forge Engine and Savage Worlds have attributes and skills with increasing ratings; 1 to X ratings for Forge Engine, die steps for Savage Worlds. Forge Engine and Savage Worlds have derived statistics; Forge Engine has the character's Health, Energy, and Physical and Mental Defenses, Savage Worlds has Charisma, Parry, and Toughness (all characters have 3 Wounds, as opposed to Health). Savage Worlds has Edges and Hindrances that are a mix of character bonuses, abilities, narrative interventions (e.g. Bloodthirsty), in Forge Engine these are all skills (and the system doesn't have narrative interventions). Savage Worlds has Edges and Hindrances are purchased once only; Forge Engine skills have ratings. Savage Worlds' Edges and Hindrances have variable costs (Major or Minor), Forge Engine skills have the same cost for each rating increase (1 CP). Forge Engine core mechanic is opposed d10 dice pools (without mathematical modifiers), Savage Worlds core mechanic is one exploding die (or two dice for Wild Cards, player characters and notable NPCs) with mathematical modifiers vs target number. Forge Engine has an energy economy to allow flexible action use, Savage Worlds has a fixed action economy (but does allow one additional action with penalties for all actions if this is used). Forge Engine Combat attack steps are spend energy for weapon, add optional extra energy (up to your attribute), gain bonus dice for applicable martial skills, modify number of dice in the pool for circumstances. Combat defense steps are use PD dice, add optional extra energy, gain bonus dice for applicable martial skills. These pools are rolled opposed. Damage is equal to number of attack dice equal or higher than single highest defense die. Apply damage. Savage Worlds Combat attack steps are roll Fighting or Shooting step die/dice and the Wild Die, choose which of these to use, apply mathematical modifiers for circumstances. Target Number is either character's Parry for melee or a fixed number for ranged. Calculate raises (1 raise for each 4 that attack is above TN). Melee weapons do exploding Strength die + exploding weapon damage dice + exploding raises raises damage. Ranged weapons do exploding weapon damage + exploding raises damage. Compare damage to target's toughness, if damage is higher than Toughness, the target is Shaken, and if excess damage generates raises, target also takes 1 wound for each raise. If the target is already Shaken, that target takes 1 would for each raise on the damage. The target can spend a Benny to make a Soak Vigor roll to attempt to reduce the Wounds from damage.